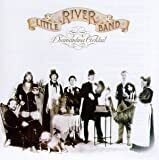 Little River Band (LRB) are a rock band originally formed in Melbourne, Australia, in March 1975. The band achieved commercial success in both Australia and the United States. They have sold more than 30 million records; six studio albums reached the top 10 on the Australian Kent Music Report albums chart including Diamantina Cocktail (April 1977) and First Under the Wire (July 1979), which both peaked at No. 2. Nine singles appeared in the top 20 on the related singles chart, with "Help Is on Its Way" (1977) as their only number-one hit. Ten singles reached the top 20 on the Billboard Hot 100 with "Reminiscing" their highest, peaking at No. 3. Only First Under the Wire appeared in the top 10 albums on the Billboard 200. Early members were Beeb Birtles, Ric Formosa, Graeham Goble, Roger McLachlan, Derek Pellicci and Glenn Shorrock. Most of the group's 1970s and 1980s material was written by Goble and/or Shorrock, Birtles and David Briggs (who replaced Formosa). Little River Band have received many music awards in Australia. In May 2001 the Australasian Performing Right Association (APRA), as part of its 75th anniversary celebrations, named "Cool Change", written by Shorrock, as one of the Top 30 Australian songs of all time. The 1976 line-up of Birtles, Briggs, Goble, Pellicci, Shorrock and George McArdle (who replaced McLachlan), were inducted into the Australian Recording Industry Association (ARIA) Hall of Fame at the 18th Annual ARIA Music Awards of 2004. Little River Band have undergone numerous personnel changes, with over 30 members since their formation. None of the musicians now performing as Little River Band are original members, nor did they contribute to the success the band had in the 1970s. In the 1980s, members included John Farnham, David Hirschfelder, Stephen Housden, Wayne Nelson and Steve Prestwich. Currently the line-up is Nelson with Rich Herring, Greg Hind, Chris Marion and Ryan Ricks. Two former members have died, Barry Sullivan in October 2003 (aged 57) and Steve Prestwich in January 2011 (aged 56).